"By the torture. prolonged from age to age, By the infamy, Israel's heritage, By the Ghetto's plague, by the garb's disgrace, By the badge of shame, by the felon's place, By the branding tool, the bloody whip, And the summons to Christian fellowship—We boast our proof that at least the Jew Would wrest Christ's name from the Devil's crew." His principal Jewish poems were "Rabbi Ben Ezra" and "Jochanan Haḳḳadosh," the former giving the life-philosophy of a Jewish sage, who may perhaps be identified with Abraham ibn Ezra; it is full of true Jewish optimism. "Jochanan Hakkadosh" is an account of a great rabbi who obtains the privilege of additional months of life given up to him by his pupils, through whose experience he passes. He declares that all is vanity, after three months' experience of the life of a married lover, of a warrior, of a poet, and of a statesman. But by accident he has also obtained the gift of three months from the life of a little child, and this experience harmonizes all the discrepancies, and enables the sage to feel that life is not altogether in vain. Other poems of Jewish interest are: "Filippo Baldunecci on the Privilege of Burial" and "Ben Karshook's Wisdom"—the latter an extension of the saying in Pirḳe Abot, "Repent the day before your death." 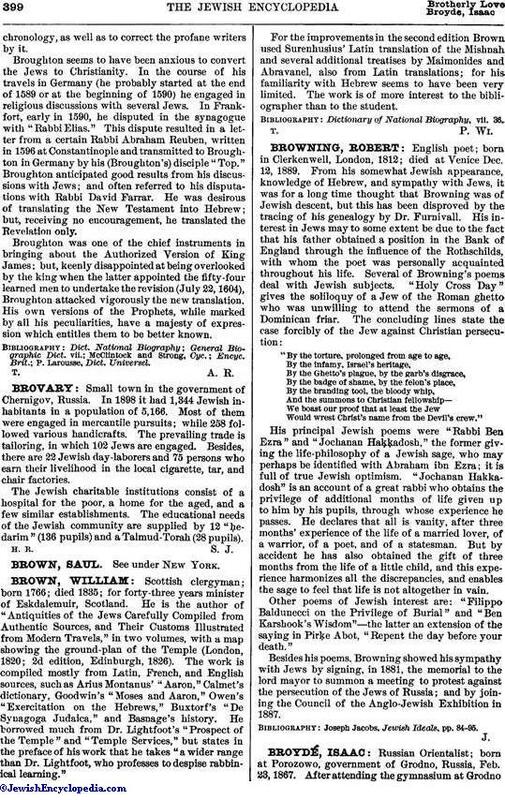 Besides his poems, Browning showed his sympathy with Jews by signing, in 1881, the memorial to the lord mayor to summon a meeting to protest against the persecution of the Jews of Russia; and by joining the Council of the Anglo-Jewish Exhibition in 1887. Joseph Jacobs, Jewish Ideals, pp. 84-95.